The scenario of the study area includes the seas to the south of Cuba: shallow, transitional and deep waters, characterized by the Batabanó, Ana María and Guacanayabo gulfs, parts of the Yucatan Basin, the Cayman Ridge and the Cayman Trench (on the edge of the Bartlett Fault). For this territory, with a low degree of seismic study, it was very important to count with other complementary non-seismic exploratory tools, like Digital Elevation Model, that allowed a preliminary assessment of the prospective areas. 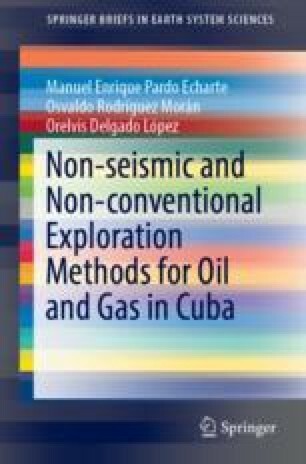 Then, the geological task posed to the morphometric processing and interpretation consists of the morphotectonic regionalization, with precision of the morpho-structural evidences of the so-called Camagüey Trench existence and, the establishment of possible sectors of oil and gas interest linked to the presence of geomorphic anomalies, presumably Indicators. For such purposes, the Digital Elevation Model 90 × 90 m was processed. As a result, the Morphotectonic Regionalization of the South Cuba marine territory was carried out, recognizing three types of regions: shallow waters (less than 100 m), transitional waters (greater than 100 and less than 3000 m), and deep waters (greater than 3000 m), from which could be characterized the different physiographic features already known. According to the interpretation, the existence of obvious signs of a trench and, therefore, of a paleo subduction zone in southern Cuba, is not recognized. Taking into account the range of amplitude of the geomorphic anomalies, if there is an active petroleum system, the areas of greatest prospective interest would correspond to the three gulfs (shallow waters) and, to the southwest and south of Batabanó Gulf and the northern limit of Cayman Ridge (transitional waters). The anomalies in deep water are vetoed by the huge water strain.